Hi everyone! LeAnne here.....thanks to everyone who participated in the Tic-Tac-Toe challenge last week! It was fun to see all the ways everyone played---I got a lot of inspiration for upcoming card creating! Before we get to my choice for Headliner, let's see what caught the eye of the design team. 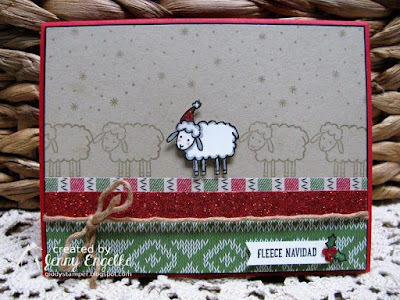 Every little thing about Jenny's card made me smile: the little white sheep wearing a Santa hat, standing amongst the other little sheep; the snowflakes on the Crumb Cake background; the red glimmer paper and warm prints from Warmth & Cheer; but that sentiment, "Fleece Navidad"...had me in stitches, no pun intended! Cute as can be! Congrats, Jenny, on being my Headliner this week! Thank you again to everyone for playing along with us! Congratulations to all our winners, please pick up your badges here. Be sure to come back tomorrow for a fun theme challenge from Laurie! Thank you for picking my card, Hannelie. :) Wow, all the cards are amazing!!! Truly inspirational card. Love it! Thanks for sharing. Thanks for the shout out, Sandy! Congrats to all the winners! Thank you LeAnne! You've totally made my day! Tic-tac-toes are among my all time favorite challenges to participate in and what a bonus to be chosen as the headliner! Thanks again!